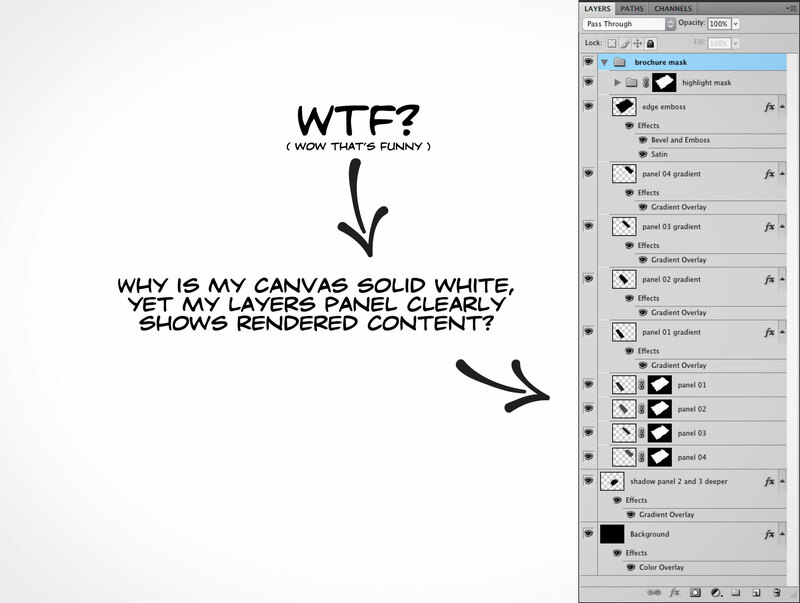 If after running STEP 2 your canvas is solid white but you notice that the Layers panel clearly contains all your designs and elements generated by the Action then the culprit might be your version of Photoshop. Prior to Photoshop CC was CS6, also known as release 13. Shortly after the release of 13.0.0 was what is called a point release, specifically 13.0.2 — this version had an incredibly obscure memory leak when executing Actions with very high resolutions (which means it affected nearly all the Actions on this site). After running STEP 2 the Action appears to run without incident, however, when the Action was complete the canvas would appear to be solid white even though the Layers panel clearly showed that the Action did generate a new document with multiple layers. The solution is to update to 13.0.3 or higher. There is no hope with a fix for 13.0.2, if you only have access to this point release then you will not be able to run the Actions from this site.